This unique piece represents the special, life-sustaining bond between mother and baby whale – one that we are fighting to protect at the highest levels. We head into the courtroom on December 13th to defend endangered whales at risk of harm from oil and gas drilling in the Gulf of St. Lawrence. 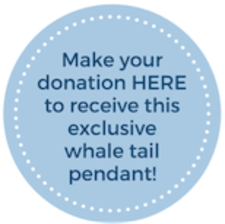 Show your support for endangered whales by wearing this one-of-a kind design, and check something off your holiday to-do list - you already have one (or more) gifts! Thank you for everything you do to protect our treasured species and spaces! Thank you for standing with whales when they need you the most! Made in Canada with care and donation of time especially for Sierra Club Canada Foundation by WoodEnvyDotCom.